Explore More Of The Mountains, Join Us On An Off Piste Adventure! We recommend choosing an appropriate ski for any of our off piste skiing lessons in Chamonix. Use a ski that is 85mm wide underfoot (or greater), and is as long as you are tall (approximately +/- 3cm). Please avoid using short and narrow skis off piste, while they may feel lovely on piste, it will make things more difficult for you off piste. Avalanche safety equipment is required, except for the level 1 skills group. And can be hired from us, and most rental shops. If you need advice, let us know, we are here to help. This session is focused on understanding how the skis work when moving through soft snow. Then getting into how to adjust the skills you currently use on piste, so that you can begin to move through varied snow conditions off piste. Once we can starting moving off piste, we use short sections near to the piste. The aim is to be able to link a few turns together, off piste, in varied snow conditions. On gradients that work with your skill level, not against it. After this, its time to enjoy practising and come back to us for level 2. Are you already able to link turns off piste in varied snow conditions on gradients equivalent to blue terrain? Perhaps you would like to ski more of the available off piste mountain terrain around Chamonix? Here we will briefly re-cap how the skis perform in soft snow. Then we will start to refine your skills according to your performance requirements, and any goals you may have. This will be done through a mixture of drills on piste, and off piste. Drills and development are always particular to the individual. So in a group environment we may have some circuits going at this time. This allows individuals to progress at their own rate in a safe environment. Where appropriate we will scale the level of terrain being skied to your development and goals. ** Here is an example of a mountain hut we use. We will provide transfer to our starting point. We schedule groups in Chamonix for all our off piste ski lessons. Just, look out for blue dates in the calendar, click straight through to the date you want, and book online. to find other groups. You can of course book a private ski lesson of any of our off piste skiing groups in Chamonix. Just let us know in the notes field when you book your private lesson online. If you want to book a private lesson to guide an Alpine Touring route, you will need a FULL day. You dont need to be super fit, you need to be comfortable spending a few hours hill walking, at a relaxed pace. You dont need to be a high performing skier. 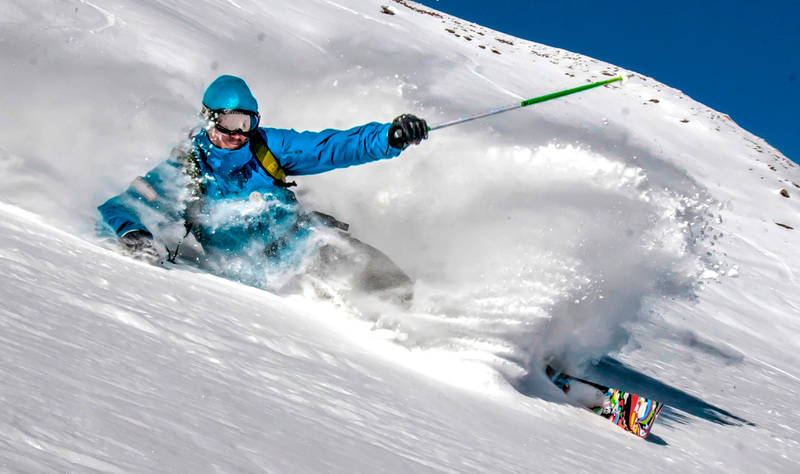 You just need to be able to ski varied snow conditions. On gradients approximately equivalent to: blue terrain for Alpine Touring 1, or red terrain for Alpine Touring 2. You will need: ski touring skis/binding, skins, ski crampon, transceiver, shovel, probe, and rucksack (Don’t worry, when sessions start we will carry out a kit check and briefing). Alpine touring equipment can be rented as a “ski randonnee” or “ski touring” package very easily from most good ski rental shops around the Chamonix area.